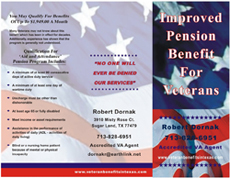 The Department of Veterans Affairs offers a myriad of benefits to veterans. As a general rule, a veteran is defined as someone who served in the armed forces of the United States. For some benefits, up to 2 years or more of service is required. Below we have a list of articles about benefits which are more applicable to senior veterans and their surviving spouses. It is our intent to help veterans (the elderly) and their families plan for long term care and maintain their health, independence, and savings.